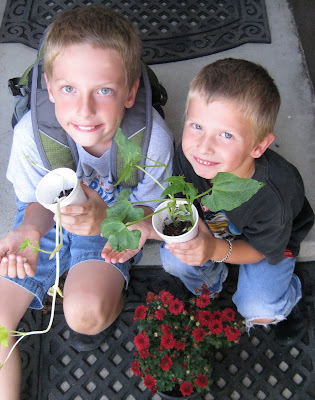 Nathan brought home his Lima bean plants today. One was grown outside in the sun, the other in the back of the classroom. The bright green one had lots of sun, the one with the pale leaves and long stem grew in the back of the classroom and had to stretch for light. The boys are holding lima beans in their hands, which you can't really see. Benjamin has been doing a growing project of his own as well. I bought live plants as centerpieces for the bridal shower last weekend, and Ben picked out a plant for himself, which was all buds, no flowers. He's watered it each day and is happy to see all the orangey-red flowers in bloom.